Outdoor Advertising - No Electricity Needed! Boost your sales right away with a colorful display! Why pay an employee to wave a sign on the corner when a colorful PromoFlag will never need a lunch break? 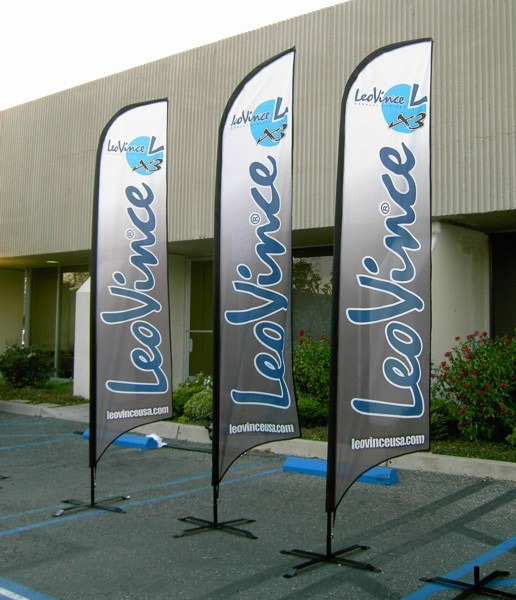 Waving, spinning and fluttering in the wind, these modern PromoFlags will catch the eye of passersby and convey your message in a non-intrusive way. Unique design keeps flag stretched, so its message remains visible even when there are no breezes to move it. We have dozens of pre-printed designs in stock that are ready to ship, or choose to have your logo or message digitally printed in full color. Full Color Digital Printing is included in the price! Included in the complete kit is everything you will need to install your PromoFlag. 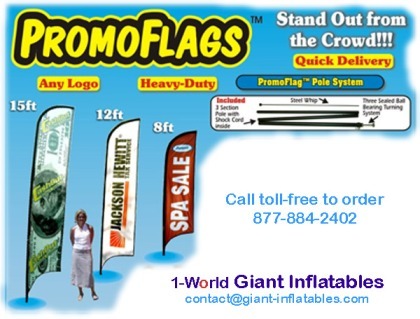 Choose from 8', 12' and 15' tall PromoFlags with your logo or message digitally printed in full color at no extra charge. The Pole System, with sealed ball bearing turning action, and aluminum and stainless steel pole fold down into three sections and all pack into an included carrying case. The PromoFlag ground stake mounting is included as part of the complete kit. Optional mounting systems, suitable for mounting on walls, tents and cars are also available. All mounts have a locking pin to secure PromoFlag to base. Your entire PromoFlag display can be packed in the trunk of a car and set up in a few minutes, no electricity required. Examples of digital printing (included in price) shown below. Click an image to enlarge. CALL TOLL-FREE 877-884-2402 FOR A QUOTE.